Build your own vault on July 26. While it was confirmed last week that the impressive-sounding Nuka World will be Fallout 4’s last installment of DLC, there’s still much to get excited about over the incoming Vault-Tec Workshop expansion. It’s now received a release date—July 26—and will let players craft their own vaults, fill them with furniture and tech, and run tests on its citizens. It all sounds a bit like Fallout Shelter which, according to the Fallout 4 official Twitter account, is expected to launch on PC alongside tomorrow’s update 1.6. “Build a brighter future underground with the all-new Vault-Tec Workshop,” reads the blurb for the latest DLC on the Bethesda site. “Create a massive Vault and attract new Dwellers using pre-war industrial kits complete with retro-nostalgic furniture, lighting, and art. Although we’ve been treated to more Fallout 4 DLC than perhaps first expected, the quality has been variable to see the least. 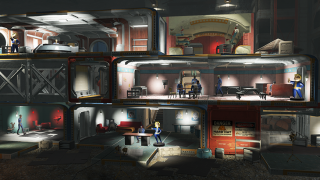 Vault-Tec Workshop sounds far more substantial than, say, Wasteland Workshop—which Chris struggled to recommend, even at just $5—though, and with Nuka World also on the horizon, it seems Fallout 4’s expansions plan to go out with a bang. Fallout 4's Vault-Tec DLC will launch July 26 for £3.99/$4.99.